Please be informed that Iskandar Regional Development Authority (IRDA) in collaboration with Economic Planning Unit (EPU) would like to invite you to participate in the Iskandar Malaysia TVET & 1Malaysia Training Scheme (SL1M) Career Fair 2016 on 12th ~ 13th October 2016 (Wednesday & Thursday). The objective of the Iskandar Malaysia’s Career Fair is to provide the opportunity to showcase the current and future career opportunities within Iskandar Malaysia. Besides potential recruitment and exposure to your organization’s services and products, many other benefits can be achieved from the event such as public awareness and talent attraction. The proposed program is also expected to increase graduate employability velocity by having on-the-day interview sessions which leads towards the pathway to employment. 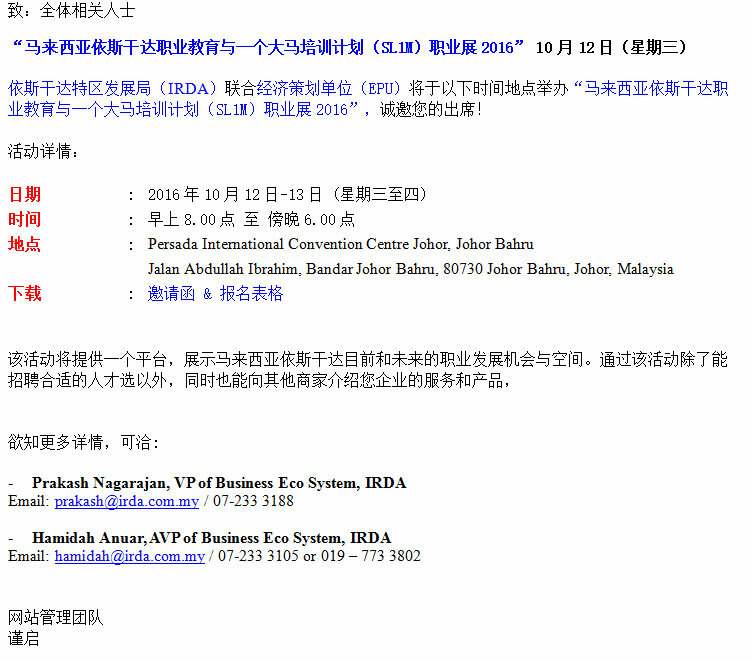 IRDA as the collaborating partner would also be providing an incentive to the companies involved in hiring the graduates under the Iskandar Malaysia Employment Grant (IMEG) a 50: 50 Matching Grant for up to 6 months’ salary and training incentives for hiring to the employer upon hiring qualified candidates during the session. Kindly reply with your confirmation by completing the registration form, the registration deadline is before or on 6th October 2016, Thursday.